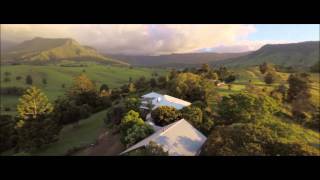 Worendo Cottages offers a peaceful setting in the Lost World Valley overlooked by the rugged mountains of Lamington National Park. On offer is an invigorating escape from the mundane in a stunning and peaceful wilderness setting. Romantic cottages for couples or Farm Houses for bigger family and friend groups. Set in the Scenic Rim region - an easy drive from Brisbane or the Gold Coast. This is truly romantic comfort on the edge of wilderness with beautiful spaces for relaxed walking, photography or bird watching. The dams are stocked, the animals friendly and the picturesque hut on the river makes an ideal lunch or swimming spot. Can your camera capture a rainbow? Overlooked by the dramatic Mountains of Lamington National Park, Worendo Homestead is a fully restored, majestic Queenslander house sleeping 12 in comfort. Worendo Homestead makes a perfect location for family and friend groups looking for a farmstay break. The house features large wrap around verandas for dining or relaxing, indoor and outdoor fireplaces, stunning views and a large fully equipped kitchen. Larger groups can also rent the Worendo Treehouse which is connected via an elevated walkway. This increases the capacity to 17. The Treehouse is a two bedroom (one with queen bed and the other with two singles and a trundle) self-contained cottage designed to take advantage of the spectacular scenery with timber lined interior, and floor to ceiling glass. It has a wood fire, muslin draped bed and private verandah. Romantic comfort on the edge of wilderness. The Wild Lime Cottage has one bedroom (queen bed) and is self-contained. The lounge room has a double sofa bed and two singles. It has a spa and bathroom courtyard with an indoor and outdoor shower. The wood fire is warming and the gleaming stainless steel kitchen houses the Wild Lime Cooking School. The large verandah offers space to ponder the mountains. The cottage is designed to let the outside in and make the imminent mountains seem closer.